Florin Pogonaru is the coordinator of the “Central European Financial Services” Group for Romania and member of the boards of directors and investment committees for the Romanian Post Privatisation Fund. From 1997 he is a member of the Business Advisory Committee of the Southeast European Cooperation Initiative, and since 2002 holds the same position in the Stability Pact. 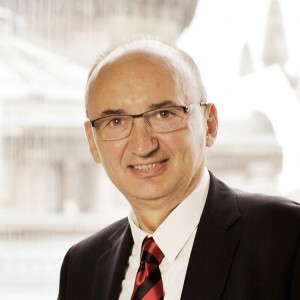 As of 2000, he is President of the Businessmen’s Association of Romania (AOAR) and since 2004 rotating chairman of the Association of Employers Confederation of Romania (ACPR) – the most influential employers association in the country, member of UNICE. As member of the BAC of SECI, Mr. Pogonaru is actively involved in the evaluation and monitoring of the critical issues of the business environment in the South Eastern Europe region, contributing to institutional and policy building initiative in the region (covering topics from anti-corruption activities through the Bucharest SECI centre to trade facilities between the countries of the region). Florin Pogonaru’s professional activity concentrated mainly on investment banking, being successively country head in Romania for certain important financial groups among which are Creditanstalt (CAIB), Bank Austria (IBA), Alphabank (BIG). In this capacity he was involved in the most important fund raising operations on international financial markets for investments in Romania. For reference in this sense are: the cooperation created with Alliance Capital or GED Capital and the setting up of the Romanian Fund for Investments (USD 60 mil. ), and the formation of the Romanian Post Privatisation Fund (Euro 66 mil.). At the same time, starting with 1994, worth mentioning is the instrumental role played in several privatisation deals in Romania where the investment banks he coordinated acted as consultants, or in the IPOs for Romanian companies on the local or foreign capital markets. Florin Pogonaru received from the Academy of Economic Studies – which he graduated from – a Ph.D. in Economics. He is also a graduate from the Law School of the Bucharest University. Directors or scientific councils of the Indian Institute of Finance, Canadian MBA etc.